If potential customers arrive in your town area, your hotel should pop up in Google Maps with a nice route description plus a link to your website. And customers searching for tourist information about your city bump into your website via blogs, filled with inspirational ideas and actual, relevant content. Plus of course, an interesting package deal and the invitation to take part of this local life with your hotel as home base. Unfortunately, this is often not the reality. If people search for a hotel in your city; they will probably find you on the website of an OTA; an Online Travel Agent like booking.com, Expedia.com, Lastminutebookings.com, Hotels.com and so on.com. Remember that you gave them once a written permission to use your hotel’s name and location to promote your rooms? Well, they did a fine job in taking your #1 Google position with your name; many hotel websites are difficult to find and can only be found and booked through the website of an OTA. The customers don’t care; all they want is a fast and easy way to book. The OTA websites do give a nice overview of available hotels with your cheapest room rates next to the rates of your competitors, stripped from any extra’s you can offer. With an OTA, your room price is the main information. People like value for money and are always in for a discount, they will book a hotel based upon price, not on extra’s or service. Of course, you did not start a hotel because you wanted to be good in online marketing. On the contrary; you want to be a good host for your guests; all that sales and marketing stuff became so complicated that it was better to outsource it. 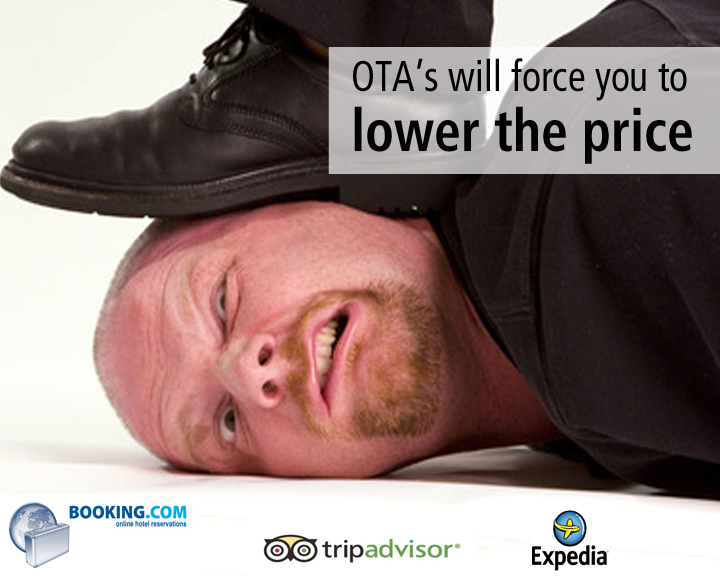 So you’re in the game of online bookings via OTA’s. Maybe you started with 15% commission for every booked room, but over the years this has become 20% and sometimes 25% commission on your room rates. This negative spiral will break down your net profit. The power of OTA’s is growing and will force you to lower the price even more, ‘because on-line competition is fierce, and you have to go with the flow in your local market.’ So they advise you to lower your rates even further; otherwise you will not show up in their search results…. This situation is becoming unacceptable; you are the owner and can sell your rooms at better rates. All you need to do (and dare) is to take another road that leads to a better profit. Don’t throw your rooms in the nonstop sale via OTA’s. Take back control over your online presence and start with a clever and cost-effective on-line marketing strategy. People should not come to you because you have the lowest room rates; they should come to you because you have a great service and tempting package deals. OTA’s can’t deliver package deals as a night stay plus theatre tickets and flowers in your room. That’s something only you can offer. And bear in mind that customers come to your city because of the city. And your hotel is just an option for a few nights stay. The core element of attraction is the region itself, and you should use that online for your benefit. Use the local agenda, find local partnerships and start creating unique experiences for your customers. First you need an attractive website that works smoothly on all devices, PC, mobile and tablet and is social connected with your other online channels. Naturally it has a direct booking system: people want instant service and to be sure that they’ve booked. Invest in a good website with the essentials you need to compete and to survive. With today’s technology, you must have full-screen images to give the visitor a good impression of your reception, restaurant, the rooms and additional services like a spa or swimming pool. Second thing is content. Google believes in genuine content and will reward your hotel website with a higher ranking if you have something interesting to say. Make sure you have two types of content executed in the way it should be. Converting content is all about convincing the website visitor. Use great images, testimonials from customers and of course an attractive reason and package to book. The other type of content is ranking content. Ranking content is the content written for the search engines; mostly 1000 to 2000 words, in a special balance between relevancy and keywords people use to search for a hotel or region like yours. This is not something your nerdy niece or nephew can do; it takes a special set of skills to write this kind of content. But if done well; you will see your hotel go up in Google within weeks. Third and also highly important is your social presence and special interactivity. Make sure that all your guests become friends on Facebook and follow you on Twitter. Reward them while they are staying in return for this ‘data’ with a nice drink, a towel or a voucher for a nice theatre show. In that way, you can keep the line with them, and share your upcoming promotions in an easy way. Make the best out of your social media activities and use of e-mail, dm’s. Even printed postcards are very effective to stay top of mind. Fourth point of attention is data. Use the database with your clients over the years to reconnect. If you don’t have an up to date database (you’re not the first to admit!) it is time to start working on collecting data. Data is important and can be collected with fun and friendly in-house communication. With the use of customer data in combination with your online and social activities, you will generate more direct traffic to your website and more direct bookings. Share the post "Your hotel and Google"